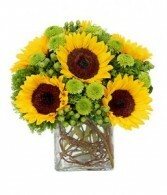 Any newly expectant mother is secretly wondering if her loved ones will acknowledge her this Mother's Day. 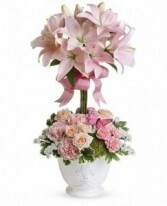 Make her day with this bright, fun bouquet featuring vibrant roses, lilies, gerbera daisies and iris nestled above a cloud of white hydrangea. 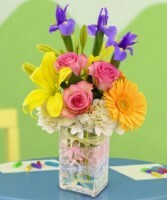 Hand delivered in a tall rectangular vase accented with pastel ribbon, this beautiful floral arrangement is a perfect way to commemorate her first Mother's Day!